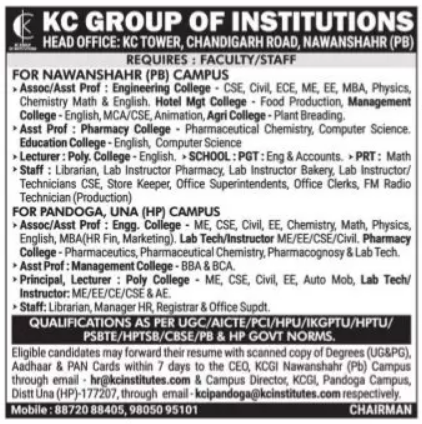 KC Group of Institutions, Nawanshahr has advertised in the TRIBUNE newspaper for the recruitment of Associate Professor / Assistant Professor / Lecturers / Principal Plus Non-Faculty jobs vacancies. Interested and eligible job aspirants are requested to apply within 07 days from 23rd January 2019. Check out further more details below. About College : K.C. College of Engineering & Information Technology was established under the aegis of K.C. Social Welfare Trust with four branches viz Computer Science, Electronics, Mechanical and Electrical with intake capacity of 60 students each. The responses was over whelming and within a short span of one year. K.C. College of Engineering & Information Technology has already carved a niche among its competitor. The college has got the best infrastructure and it is in the process of establishing new departments to meet the challengers of 21st century. 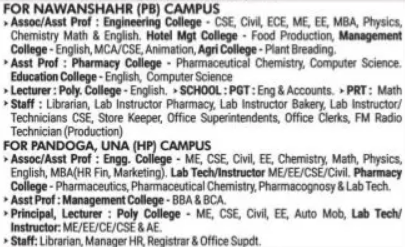 How to Apply: Interested and eligible candidates are requested to send application along with CV, copies of certificates, Aadhar card, PAN card and recent PP size photographs to the following email address or postal address.